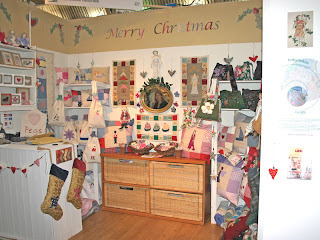 This was our stand at Country Living's Christmas show last year. A great show to do and where we met a lovely publishing lady! We have had to make the hard decision not to do Country Living's Christmas Fair this year. In addition to really enjoying doing this show, it is also very lucrative and for both reasons we will very much miss it. We are though, at this precise moment in full throws of writing our book with a finish deadline for the end of November!!! so obviously need to focus on this. Having said that we are still open for business and are already taking Christmas orders for Stockings and Advents. In the next few weeks i will be posting some images of the Advents and Stockings which we have left from last year. These will be sold off at a reduced rate. 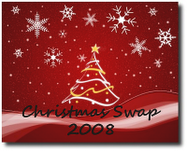 We will not be making up any new Christmas stock but we will, as usual be taking orders. If you would like something made to order please don't leave it too late to contact us as we are only able to take on a limited number of orders this year. Our next show is the RHS's A Taste of Autumn at Wisley. This is a fantastic event which runs from the 19th to the 22nd October and also hosts The National Fruit Show. Check out the link for further info. We will be exhibiting on the Saturday and Sunday only. Please come and say hello if you are there. 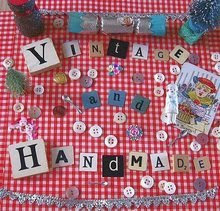 We may also, time and book permitting, do a few small local craft fairs. I will posts details if we do. As i write this the sun is shining and it's hard to think Christmas is not too far away. ( sorry!!) 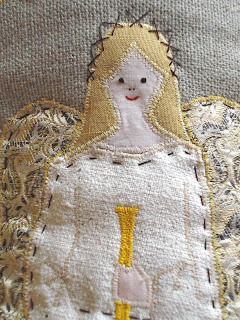 I have been using the light today to photograph some of the Christmas stock to put on the website. It has got me wondering how early do most people start to think about the festive season? Have you already started buying or making presents? My mum has declared we are having a frugal, thoughtful, non excessive low impact Christmas.. basically she doesn't really want a present and would rather money go to a charity or to people less fortunate. As we are all creative i expect homemade will be the order of the day. Last year Alice and i decided to buy 'thoughtful presents' and we bought a lot of things from Ecotopia and The Centre for Alternative Technology. How do you feel about Christmas? What does it mean to you? Do you hate all the commercialism? It is far too early for me to be posting this? ok.. so we have only just got used to Autumn... Only one day left to vote for your favourite season on my little poll on the side bar. Autumn is out ahead at the moment. Can it be caught or are you all just happy in the' here and now'? At the moment I'm loving Autumn but nothing can quite compare with the light and excitiment of Spring after a long, grey winter. I haven't thought about anything to do with Christmas yet (other than sloe gin) but I'm sure my head will be full of it soon enough! Congrats again on the book and good luck with Wisley. You've had a wonderful, successful year, long may it continue !!! Oh that is so exciting about your book! Congratulations! 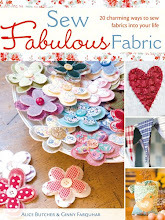 Is it going to be a pattern book or more of a crafty lifestyle book? (or can you not say yet?). 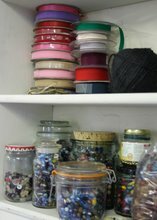 I'm making some things for my daughter's school craft stall this year, and last year I did the children's christmas activities, and I think that if you do anything like that you need to start thinking about it around the start of September (well, I do anyway, but maybe I'm a slow thinker!). I like this though - the flurry of activity, there's a feeling of 'nesting' to the whole thing. Our fair is at the beginning of December and what I found last year is that my mind was so on Christmas that I'd also done all my Christmas shopping by that date too, which meant I had a wonderfully relaxing December! But yes, I think if you're not doing something like that it's too early to be thinking about Christmas as I know my non-crafty friends get incredibly irritated by how early Christmassy things get mentioned/appear in the shops. I've just heard that CL is going to do a Christmas Fair in Glasgow next year - very excited about that one, your stand in London looked fantastic. It is good having these things punctuating your year isn't it - you can look back at them and see how you have improved over time. I love and hate Christmas, I love to see all my family and friends and I love spending time decorating the home, especially the tree, but I hate the mad rush around the shops and watching people going absolutely crazy just because it is Christmas. I have a limit to what I spend on each member of my family and friends, I really can't see the point in running up a massive credit card debt or getting too overdrawn at the bank, why do it and give yourself worry and sleepness nights for the rest of the coming year. What I do make sure I do though is to put a lot of care and thought into what I buy for each individual, that is important to me. I did buy a few bits last Christmas ready for this, I just hope I can find where I put them? And yesterday, I got an invite to my friends' home-made Christmas card party in November, so I guess for some people it is never too early to start thinking about Christmas. I am with you on the favourite season, I have tried to vote for Spring in your poll but my computer isn't allowing me to do so, but at least you know! Your book is very exciting and your stands look wonderful. I always find it hard to set up the stand. Tastes of autumn looks a great show to do, I will have to see if I can find out more about it. Looking forward to hearing all about the new book. Your Country Living Stand looks adorable! I'm not keen on the high street commercialism of Christmas, but having said that I'm doing my first Christmas Fair tomorrow! I do love the run up to Christmas and like to start thinking about it and preparing early. But I like it to be as handmade, traditional and non commercial as possible. The photos of past stalls are marvellous, you should consider a sideline in set-designing, it looks like a perfect little living-room space! I was thinking of knitting a stocking this year, I've done socks, and as it's not got to be worn I don't think I'd have to do it on dpns either - I must look into that! Good luck at Wisley and continue to enjoy Autumn, lets hope the weather stays nice! Congratulations to you both on a busy year with real highlights for a small business. I hope to visit the Wisley show so may see you there. I hope that you are enjoying the preparation of the book - such an exciting time. Lovely pictures. As for Christmas, I try not to think about it until after half-term but when I was in Oxfam this week I did buy an advent candle! Florence..The book will contain 20 projects so lots of patterns. It will also contain some extras for inspiration.. i too am not sure how much i can divulge. Even though we have a deadline coming up it is not due for release till Autumn 2008. Jane.. cold much better thanks.. yes i did see that CL are doing Glasgow.. are you tempted? Kim and Louise.... Afraid Autumn wins the vote even though we love the Spring. I expect if i do a poll in Spring it may well come out on top! Joanna and Tash... i find it much easier with a larger stand space. It is rather like set design (my past was in theatre costume and i picked up a lot working with great set designers).. i really get a buzz from seeing a space come together. 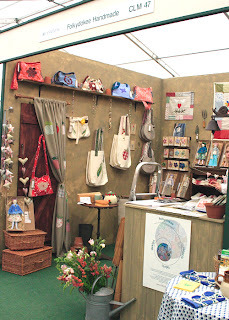 The stall at Wisley (where i may meet alice c) is only a table which i always find a challenge.. especially as we have lots of different products to display. Willow...for the last few years we have burned an advent candle. I love the quiet and the chance to read stories together. My mum bought The Christmas Mystery by Jostein Gaarder which we read like this last year. Well yes of course it's too early to talk about Christmas but then again it's not. If your selling Christmassy stuff you will no doubt have been talking Christmas during the summer and really what is the point in losing sales to the chains on a point of principle. I'm amazed to see all the Christmas stuff coming in already, I think this must be the earliest yet. And don't forget for those of us baking our own CHristmas cakes now is exactly the time to be talking CHristmas. A book is so exciting but I bet it's an awful lot of hard work too, congrats and best of luck. Good Luck at Wisley too, looking forward to seeing the photographs of your stand. can't believe i've not come across your blog before but i'm pretty certain this is my first visit. lovely things, good luck with the book project! I am always excited about Christmas. I am trying to get on with making handmade presents for people for Christmas, I like the personal touch. We are going to buy, and decorate a little shed for our little girls Christmas present, so that she can have her own individual wendy house - very cute. Congrats on the book, how exciting is that?? I love Xmas! But I love Halloween MORE!!! The set up looks great! I love those little dolls! I can wait to see your book! I just had to leave a message to say thanks for your blogroll. I don't know how you do it but you manage to find some really great blogs from all over the world. I was fascinated by Eyes of Wonder and now by The Glass Doorknob. Keep up the good work! Your show booths look great. I am so behind with preparations for Christmas ~ I haven't made a thing and I have a big show in less than 2 weeks!